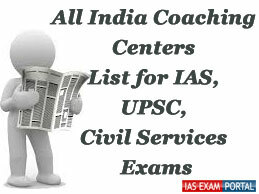 All India Coaching Centers List for IAS, UPSC, Civil Services Exams | IAS EXAM PORTAL - India's Largest Community for UPSC Exam Aspirants. Disclaimer-1: Although publisher have made every effort to ensure that the information in this book was correct, the author and publisher do not assume and hereby disclaim any liability to any party for any loss, damage, or disruption caused by errors or omissions, whether such errors or omissions result from negligence, accident, or any other cause. Disclaimer-2: We neither represent nor endorse the accuracy or reliability of any advertisement on our website, or the quality of any products, information, or other materials displayed, purchased, or obtained by you as a result of an offer in connection with any of these advertisements. PAID Advertisements are clearly marked, We strongly encourage you to do your own due diligence before responding to any offer/claim.